NDT - Non Destructive Testing Helping you perform the test in an efficient and safe manner. Common problems identified in NDT Testing such as burning of operators from overhead lamps, disturbance by Magnetic fields, and long start up times create an interruption while performing tests. Labino UV-lamps make use of MPXL as well as LED technologies, offering strong performance and overcoming all above mentioned drawbacks of such methods as Fluorescent Magnetic Particle Inspection (FMPI) and Fluorescent Penetrant Inspection (FPI) that are still used in the NDT (Non Destructive Testing) field even today. Labino UV Inspection Lamps have been used within Non Destructive testing for almost 20 years. Our goal is to constantly gather knowledge from you and use that knowledge to develop new high performance UV Blacklight lamps to fulfil your needs. Crime & Forensics Labino helps you see what your eyes can’t see at a crime scene. At a crime scene, fast and accurate detection of possible traces is of vital importance. Many biological fluids are fluorescent in nature. When such traces are illuminated with light of the right wavelength they fluoresce and are detectable to the investigator. The degree to which various substances become visible when using different filters depends on the state of the substance and the surface on which the substance exists. Deciding what light source to use to achieve the best result in finding traces at the crime scene is an art. It takes years of experience to learn what light to use depending on the occasion - it’s not an exact science. New users using ALS (Alternative Light Sources) can of course use combinations of light and goggles to determine the best option for that occasion using trial and error until confidence and knowledge has been built up. We make it possible for each user to put together their own unique ALS kit. No crime scene looks the same. No crime scene investigator uses the same method, but we can all share experiences and learn from each other. Labino does offer professional training in using light at a crime scene. All their trainings are held by Crime Scene Investigators. Further Information on Forensic Lighting and application can be found here. Curing & Coating Applications Curing with UV when time, perfection and safety is a given priority. Curing using UV Light Curing with high intensity UV light is used to instantly dry inks, coatings, and adhesives. The process is based on a photochemical reaction, when liquid monomers and oligomers are mixed with photo initiators, and exposed to the UV light. UV curing is used in many industries including automotive, electronics, telecommunications, graphic arts, converting and metal, glass and plastic decorating. The UV curing process has many advantages over traditional drying methods in terms of production time, number of errors, manufacturing space, and environmental issues. Depth-curing with UV radiation, at wavelengths between 300-400 nm give the best results. The method gives very short curing times to handling strength as well as low heat generation and energy consumption. Curing Silicon with SuperXenon at low temperature Many silicone products are cured using UV light for electronic display applications. During such process the curing time must be very short and the temperature as low as possible. The actual curing time is determined based on the distance between the light source and the surface as well as the thickness and dimensions of the silicon applied. 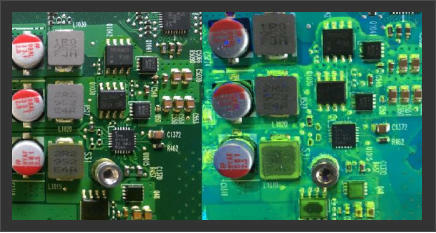 UV inspection of coatings on electronics Most PCBs manufactured are sealed with some kind of coating. Either for moisture protection, water protection or other kinds of sealing. It is of utter importance that the coating is applied in a correct way on the PCB, covering the components it is intended to. Some components are crucial to cover, others must not be covered. All coatings are clear and very difficult to see with the naked eye. The majority of all coatings fluoresce under 365 nm and become visual to the human eye. Inspecting the PCB with Labino ultra violet light ensures that the coating has been applied correctly. Lighting Effects Illumination with UV Light UV-Light combined with fluorescent colours creates special lighting effects. These colours can be in the form of spray paint, make-up, colourful clothing, as well as special fluorescent liquid mixed with water. Ultraviolet light is invisible to the human eye and only the fluorescent material glows when UV-illuminated - everything else will remain dark. This is a very effective way of highlighting small or large details on a dark stage. In contrast, if white light (visible light) is used to highlight small or large details, everything that is hit by the white light will be illuminated.The Labino lamps (LED and MPXL) produce such a powerful concentration of UV-light that they can be mounted high above the stage or arena, where the normal white light lamps are mounted. This in turn enables lighting designers at theme parks or other stage productions the possibility of creating staggering special effects. Labino lamps are currently used at several Disney parks. Thanks to their light weight and small size, Labino UV-lamps are also easy to mount and can be placed wherever the effect is optimized. As Labino UV-lamps are of industrial quality and IP65 approved (IP68 for MB Series), they can even be used outdoors. In addition to offering unbeatable performance, the Labino UV-lamp also has a power consumption of only 44 watts, which means that it generates very little heat. Automotive Leakage Detect engine leakage with high intensity UV-Light 63,000,000 automotive engines are inspected every year. Several of the inspections regarding leakage of oil, gasoline, diesel and glycol are made by UV illumination. The Labino Spotlight and its subsequent UV illumination, based on the MPXL technology, makes detecting engine leakage easier. By mixing certain fluids with different coloured fluorescence, it becomes possible not only to identify engine leakage, but also to identify the source of leakage; i.e. oil, gasoline, diesel or glycol on spot. The new Labino Torch Spotlight, based on the LED technology, is suitable for quick inspection and in areas hard to reach. Leak Detection Use Labino Ultra Violet Lamps to detect leakage not visible to the human eye and identify leakage at an early stage. Leak detection using fluorescent tracer additive In order to detect fluid leaks and their sources quickly, UV (365nm) lights are used together with UV fluorescent tracer additives. This method is used by most manufacturers of petrol and diesel vehicle engines, earth moving equipment and fork lift trucks. Leakage is detected the following way. The UV fluorescent additive is mixed with a fluid system, e.g. water, oils, fuels, coolants and refrigerants, and then the equipment is operated as normal to allow the fluorescent additive to circulate throughout. If the leak occurs, the UV fluorescent tracer will run with the fluid and remain at the site of the leak. After that, all external surfaces such as pipework, joints, connectors, gasket seals and coils are inspected with the UV light. The leak and its flow path will glow bright yellow/green under the UV. Leak detection using LabinOil LabinOil is a florescent dye and should be used with petroleum based lubricants. The fluorescence in the LabinOil is activated by irradiating with UV-light. Labino UVG2 Spotlight Torch is a powerful LED light source used together with LabinOil. You do not need to clean the engine before or after the engine leakage test, nor do you have to empty the engine oil. You add the dye into the engine oil, start the engine to make the dye mix with the oil and circulate in the engine. Illuminate using the Labino UVG2 Spotlight to identify leakage. No special training is required when using the LabinOil kit. Finding Flaws with UV Light UV-light is used in industry to determine if the surface of a component is thoroughly covered by conformal coatings, i.e. transparent coating and lacquer. Examples from the Swedish industry Casco (Akzo Nobel) manufactures for coating components with glue. For quality reasons they perform ocular surveillance by mixing fluorescent substance with the glue and the UV-illuminating the surface of the glue coated object. Non-coated parts do not fluoresce. One or several Labino UV-lamps are fitted on each machine, depending on the size of the coated object and the amount of surrounding visible light. Scania uses the same technique to determine if their truck chassis are completely coated with lacquer. Ericsson uses Labino lamps on their production line for loud speakers, used in mobile phones. Since these parts are very small, they use a sensitive camera to detect non-coated areas. Cleanliness Applications Purity Control Hygiene and UV-lamps Certain materials and substances are fluorescent in nature when illuminated with UV-light. Dairy production. Due to health regulations, it is essential that the equipment used in dairy production, such as tubes and vessels, be cleaned on a regular basis. Some proteins found in milk and yoghurt are fluorescent when illuminated with UV-light. By using the Labino UV-lamps, dairy manufacturers are able to discover not only if their equipment is clean but also where the left over residue can be found. Sanitation Another unexpected fluorescent substance is cat urine. Sanitation companies involved in the sanitation of apartments and private houses have recently discovered how effective it can be to use UV-light to illuminate the areas affected by cat urine. Instead of cleaning and repainting every room, only those areas that are covered in dry urine splash need to treated, thereby saving the sanitation company both time and money. The UV-Spotlight is exclusively used in this application as it is the most effective lamp used in investigatory work performed during normal daylight conditions. Clean Rooms Use Labino Ultra Violet Lamps to detect particles as small as 30 μm that are not visible to the human eye and prevent contamination in the clean room. The human eye is able to visualize a part as small as 50 μm under very good light conditions. Ultra Violet light enables the human eye to see parts almost half the size, down to 30 μm. UV inspection after Cleaning Machined Castings prior to delivery Regardless of what cleaning methods you use to clean your machined plastic or metal parts from contamination, you need to validate that the part is clean. If inspecting the cleaned parts with Ultra Violet light, you will detect contamination that is not possible to see with the human eye. By adding UV inspection to your quality process you ensure that clean parts are delivered to your customer. UV inspection prior to assembly in Clean Room Products sensitive to contamination must be assembled in a certified clean room or in a clean environment. It is of utter importance that the parts are clean prior to entering the assembly. Illuminating the parts with Ultra Violet light prior to entering the clean room decreases the risk of contamination. UV inspection during assembly in a Cross Flow Cabinet If your assembly process doesn’t include the use of a classified clean room, a Cross Flow cabinet could be very efficient. The cabinet keeps the air clean and the assembly process secured. However, the parts need to be clean when entering the cabinet. By inspecting the parts with Ultra Violet light inside the cabinet you ensure that the parts are clean prior to being assembled. Hotel Inspections Hotel Inspections can be undertaken using Ultra Violet light to detect traces of body fluids in previously occupied rooms. Many Television show hotel inspectors also effectively use this method to highlight problem areas to Hotel owners. Explore Gems and Minerals Using Labino Ultra Violet Lights Find the valuable gems and minerals by making the glow and fluoresce using Labino UV lights. Find Gems and Minerals using UV light 365 nm Minerals have the ability to reflect light and therefore to become visible to the human eye. Some minerals (but not all) have the ability to “fluoresce” meaning to temporarily absorb a small amount of light and release it at a different wavelength. This change in wavelength causes a temporary colour change of the mineral, visible to the naked eye. This change in color becomes emphatically visible when illuminated in darkness by a UV light. Fluorescence is triggered when UV radiation is absorbed by impurities within the mineral, commonly known as “activators” such as tungsten, titanium, manganese etc. However, some impurities such as iron or copper have the opposite effect, restricting or eliminating fluorescence. Most minerals fluoresce a single colour, although exceptions do exist. Many minerals fluoresce one colour under Short- Wave UV light (100-280nm) and another colour under Long-Wave UV light (315-400nm). The colour emitted makes the identification of the mineral a simple and cost effective task. Labino UV lights, large and small models, mains or battery models, are used by gemologists, jewellers and hobbyists alike to identify the correct minerals either at a work environment or out in the open. Beautiful colour change illuminating the minerals with UV Not only are fine minerals exceptionally beautiful in their own right - many mineral collectors prize the secret colour changes that occur when minerals are exposed to UV light. Only about 15% of minerals have the ability to fluoresce under UV light. 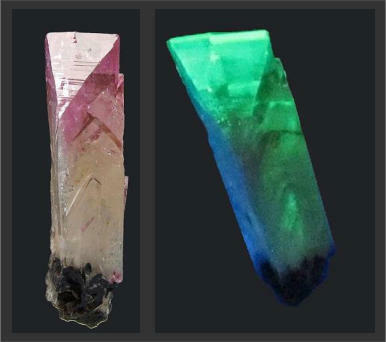 Fluorite, calcite, and adamite are common minerals that fluoresces, but it's not uncommon for ruby, kunzite, diamond, opal, zektzerite, sodalite, selenite, topaz to react beautifully with UV light. Art Examination / Conservation Detect alternations and restore cultural treasures using Labino Ultra Violet Lamps. Art examination with UV The use of UV light is a commonly used to identify the authenticity of works of art or to inspect damaged or repaired paintings. Longwave ultraviolet light (365 nm) helps to detect overpainting, repairs, and forged signatures that are normally invisible to a naked eye. The slightest alteration will stand out with extreme clarity under UV light. Not only paintings can be examined with UV, but also pieces of art made of marble, jade, and ivory. Modern paints fluoresce under UV - older paints do not Because of the different chemical properties, modern paint will fluoresce or glow under UV, while older paints will not. Therefore it can be determined whether a painted object is an antique or a newer reproduction. UV can also be used to identify whether a piece of art has been repaired and if so, how extensive was the repair. Different indications appears in different ways under UV A piece of art can be easily scanned with a hand-held UV lamp in a dark room. If there are dark blotches, they indicate over-painting and over- cleaning. Bluish-white spots indicate the presence of lining compound, dark bluish-violet indicates picture repair, and very small blue dots are dust. A chartreuse haze indicates old varnish, which shows that no recent restoration work has been done. Different lamps and filters for different applications The UV lamp, used in art conservation, should be a professional lamp with all visible light filtered out. Labino lights are perfect for this purpose. There is a wide choice hand-held lamps with special visible light filters. There are portable battery operated models, as well as mains operated. Special fixtures for permanent or studio use can be also provided. Agriculture Applications Protect crops from diseases using water based fluorescent, food grade dye penetrant and Labino Ultra Violet Lamps. Preventive Crop care for vineyards and orchards Prevention is an effective strategy used to protect crops from diseases. By applying bactericides you can protect leaf scars and other injuries and minimize the disease. It is of utter importance that the process is repeated, especially during the wet and dry seasons, to protect new wounds as they appear. Grapes, almonds, walnuts, olives and prune growers are examples of crops that benefits from this treatment with great success. Application process: 1. Fill a water based, fluorescent, food grade dye penetrant into a reservoir attached to the sprayer. 2. Spray the dye onto the crops and orchards during the day. 3. Inspect the density and coverage of the dye onto the crops after sunset, with the UV light. Detection of Aflatoxin and Mould with UV at early stage Aflatoxins are cancerous chemicals produced by special types of mould that are contaminants of such foodstuff and feeds as corn, peanuts, sorghum, copra, pistachio nuts and cottonseed. Aflatoxin contamination usually does not appear in the field. Commonly, it develops when harvested crops are stored in damp places where mold grows easily. If aflatoxin is detected at early stage, it can be isolated and stopped from spreading. This helps to prevent contamination of products, financial loss, and ensure the safety of farm products. A simple UV test helps to identify the presence/absence of aflatoxin and mould. If a fresh sample fluoresce greenish-gold under the UV light illumination, most probably aflatoxin is present, but additional laboratory tests are typically required to make final conclusions. Visualize early Penicillium with UV By illuminating with the Labino UV light you are able to visualize early Penicillium spp. infections on citrus fruit. The infected tissue fluoresces bright yellow as shown in the pictures below. The Labino BB Helios performs extremely well with this application. Rodent Control with UV For sanitation purposes, it is important to identify rodent presence in all areas of food industry. Rodent urine and hair fluoresce under the UV light 365 nm; therefore in order to identify rodent presence, the area in question should be simply illuminated with the UV light. Rodent hair fluoresces blue-white and can be easily noticed on sacking material or when intermixed with food grains for example. Rodent urine glows blue-white to yellow-white when dry. Fresh urine glows predominantly blue. Various Projects and Applications The applications list for UV appears to grow almost daily. Here are some other potential The Swedish organization Previa is responsible for continuously improving safety standards on construction sites. When subterranean work is done, such as the construction of tunnels, the intense white light that is used to illuminate the otherwise dark tunnel has proven to affect the workers’ night vision. Previa has worked together with Sweden’ largest construction company, Skanska, on a test project, using Labino UV lamps, to determine whether UV-Light can be used a complement to white light. Skanska is also testing fluorescent asphalt surfaces in combination with black light, the aim being to illuminate temporary objects on the surface of the road, e.g. detour signs or similar. When the Swedish Traffic Police set up roadside control sites, motorists occasionally complain that the officer in charge of stopping traffic is difficult to see at night. Tests have been conducted where a Labino UV-Spotlight is mounted on a mast by the side of the road, pointed at the police officer, who is wearing a fluorescent waistcoat or vest, substantially increasing his visibility. The officer operates the spotlight with a remote control. The Swedish Coast-Guard - Sea Rescue uses UV-light to detect fluorescent lifeboats and life jackets. The Labino UV-Spotlight can be used at night for easier detection, without loss of night vision, as often is the case when using visible white light. Many standard life jackets and lifeboats are made of fluorescent materials. The Swedish Forest Authorities are testing the possibilities of using fluorescent markings on trees and timber together with the Labino UV- Spotlight. The objective is to simplify identification, even in snowy conditions, of pre marked trees and timber. The markings are also used at sawmills in order to optimize cutting. A sensitive camera is used to detect the markings and the timber is then positioned appropriately before cutting. Scorpions fluoresce under ultraviolet light. The blue-green glow comes from a substance found in the hyaline layer, a very thin but super tough coating in a part of the scorpion's exoskeleton called the cuticle. Explore Gems and Minerals Using Labino Ultra Violet Lights Find the valuable gems and minerals by making the glow and fluoresce using Labino UV lights. Find Gems and Minerals using UV light 365 nm Minerals have the ability to reflect light and therefore to become visible to the human eye. Some minerals (but not all) have the ability to “fluoresce” meaning to temporarily absorb a small amount of light and release it at a different wavelength. This change in wavelength causes a temporary colour change of the mineral, visible to the naked eye. This change in color becomes emphatically visible when illuminated in darkness by a UV light. Fluorescence is triggered when UV radiation is absorbed by impurities within the mineral, commonly known as “activators” such as tungsten, titanium, manganese etc. However, some impurities such as iron or copper have the opposite effect, restricting or eliminating fluorescence. Most minerals fluoresce a single colour, although exceptions do exist. Many minerals fluoresce one colour under Short-Wave UV light (100-280nm) and another colour under Long-Wave UV light (315-400nm). The colour emitted makes the identification of the mineral a simple and cost effective task. Labino UV lights, large and small models, mains or battery models, are used by gemologists, jewellers and hobbyists alike to identify the correct minerals either at a work environment or out in the open. Beautiful colour change illuminating the minerals with UV Not only are fine minerals exceptionally beautiful in their own right - many mineral collectors prize the secret colour changes that occur when minerals are exposed to UV light. Only about 15% of minerals have the ability to fluoresce under UV light. Fluorite, calcite, and adamite are common minerals that fluoresces, but it's not uncommon for ruby, kunzite, diamond, opal, zektzerite, sodalite, selenite, topaz to react beautifully with UV light. Art Examination / Conservation Detect alternations and restore cultural treasures using Labino Ultra Violet Lamps. Art examination with UV The use of UV light is a commonly used to identify the authenticity of works of art or to inspect damaged or repaired paintings. Longwave ultraviolet light (365 nm) helps to detect overpainting, repairs, and forged signatures that are normally invisible to a naked eye. The slightest alteration will stand out with extreme clarity under UV light. Not only paintings can be examined with UV, but also pieces of art made of marble, jade, and ivory. Modern paints fluoresce under UV - older paints do not Because of the different chemical properties, modern paint will fluoresce or glow under UV, while older paints will not. Therefore it can be determined whether a painted object is an antique or a newer reproduction. UV can also be used to identify whether a piece of art has been repaired and if so, how extensive was the repair. Different indications appears in different ways under UV A piece of art can be easily scanned with a hand-held UV lamp in a dark room. If there are dark blotches, they indicate over-painting and over-cleaning. Bluish-white spots indicate the presence of lining compound, dark bluish-violet indicates picture repair, and very small blue dots are dust. A chartreuse haze indicates old varnish, which shows that no recent restoration work has been done. Different lamps and filters for different applications The UV lamp, used in art conservation, should be a professional lamp with all visible light filtered out. Labino lights are perfect for this purpose. There is a wide choice hand-held lamps with special visible light filters. There are portable battery operated models, as well as mains operated. Special fixtures for permanent or studio use can be also provided. Various Projects and Applications The applications list for UV appears to grow almost daily. Here are some other potential The Swedish organization Previa is responsible for continuously improving safety standards on construction sites. When subterranean work is done, such as the construction of tunnels, the intense white light that is used to illuminate the otherwise dark tunnel has proven to affect the workers’ night vision. Previa has worked together with Sweden’ largest construction company, Skanska, on a test project, using Labino UV lamps, to determine whether UV-Light can be used a complement to white light. Skanska is also testing fluorescent asphalt surfaces in combination with black light, the aim being to illuminate temporary objects on the surface of the road, e.g. detour signs or similar. When the Swedish Traffic Police set up roadside control sites, motorists occasionally complain that the officer in charge of stopping traffic is difficult to see at night. Tests have been conducted where a Labino UV- Spotlight is mounted on a mast by the side of the road, pointed at the police officer, who is wearing a fluorescent waistcoat or vest, substantially increasing his visibility. The officer operates the spotlight with a remote control. The Swedish Coast-Guard - Sea Rescue uses UV-light to detect fluorescent lifeboats and life jackets. The Labino UV-Spotlight can be used at night for easier detection, without loss of night vision, as often is the case when using visible white light. Many standard life jackets and lifeboats are made of fluorescent materials. The Swedish Forest Authorities are testing the possibilities of using fluorescent markings on trees and timber together with the Labino UV- Spotlight. The objective is to simplify identification, even in snowy conditions, of pre marked trees and timber. The markings are also used at sawmills in order to optimize cutting. A sensitive camera is used to detect the markings and the timber is then positioned appropriately before cutting. Scorpions fluoresce under ultraviolet light. The blue-green glow comes from a substance found in the hyaline layer, a very thin but super tough coating in a part of the scorpion's exoskeleton called the cuticle.